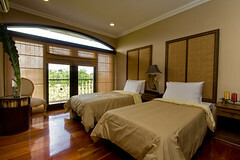 The resort has comfortable and spacious rooms for couples, families, or company outings. You may avail of the fully furnished main house or stay in our premium cottages where you can relax and fall into a deep sleep amidst the sounds of nature. All of the rooms below are air-conditioned and come with televisions, mini-refs, private bath and toilet. Casita – Fire Tree 3 P3,000 Single King-sized bed. All of the deluxe rooms below come with two Queen-sized beds, televisions, electric fans and private toilet and bath. Deluxe – Pink Tabebuia 4 P2,000 Twin Queen-sized beds, TV, toilet and bath. For groups of up to 10 people, you can rent the Main House. The Main House is the perfect accommodations for your family or barkada. Cozy and beautifully furnished, it has: two fully air-conditioned bedrooms with 2 queen-sized beds each, a comfortable living room, dining area and working kitchen. It even has its own private swimming pool & jacuzzi. Enjoy our complimentary coffee when you wake up in the morning! Main House 10 P10,000 2 rooms w/ 2 Q-size beds each (each room with a/c, TV, t&b). Reservations are confirmed upon non-refundable 50% down payment of room rates. Extra beds, pillows and linen are available upon request for a minimum fee. The resort does not provide food. A minimum fee will be charged for the use of the resort’s kitchen. In our effort to maintain the grounds of the resort, smoking is prohibited in the resort’s function rooms, hallways, lobby areas, and guestrooms. Or leave a reply and we'll respond right away.